Lawrie Sanchez became the local hero when he guided Wycombe to safety at the end of the 1998/99 season. He led the side to six away wins from the last eight to sneak out of the relegation zone on the last day of the season at Lincoln. Two years later he very nearly guided Wanderers to the completely unbelievable position of FA Cup finalists. Sanchez became the third consecutive Wycombe Manager to have previously appeared in an FA Cup Final when he moved into the hot seat at Adams Park in February 1999. Sanchez's moment was more special than John Gregory (QPR 1982) or Neil Smillie (Brighton 1983) though. 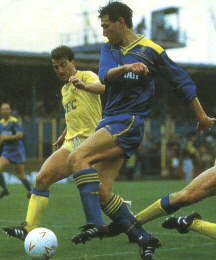 As a member of the Wimbledon 'crazy gang' team of 1988 he scored the winning goal against all the odds versus Liverpool. His headed goal means that Sanchez is folklore with Dons fans. Sanchez began his professional career at Reading following a period as an Associate Schoolboy. He made his Football League debut in October 1977 against a Wimbledon side that included Dave Bassett. After seven years at Elm Park, Wimbledon, now managed by Bassett and still in the old Second Division, paid £30,000 for Sanchez. During his eight years with 'The Dons' he hit the headlines by scoring the goal that secured promotion to the old First Division in 1986 with a goal against Huddersfield and two years later with his famous cup winning goal. It was also during his time at Wimbledon that Sanchez first encountered John Fashanu. Sanchez claimed that the striker had attacked him in a training session and suggested that there had been aggravation between the two since Fashanu joined 'The Dons' in 1985. During an interview talking about this period Sanchez said "You could say we hated each other". It was also during this time that he won three caps for Northern Ireland under the Managership of Billy Bingham. During the summer of 1995 Wimbledon took him back to Selhurst Park as Reserve Team Manager where he was successful in leading his side to the Combination title. Sanchez applied for the Wycombe job when John Gregory left for Aston Villa in February 1998 but was told no. Twelve months later he was successful in his application and his first appointment as Wycombe Manager was former Wimbledon teammate Terry Gibson as his assistant. His feats at the end of 1998/99 season earned him the respect of the fans, players and club officials alike. His Mission Statement for the 1999/2000 season was to avoid the relegation struggle and bring the missing fans back to Adams Park. This was achieved with ease as Wycombe finished 12th in the table while the crowds started to come back. 2000/2001 was seen as another year of consolidation but with the possibility of sneaking into the play-offs. However, an amazing FA Cup overshadowed all League form as Sanchez guided The Wanderers to within one game of the FA Cup Final. It took the mighty Liverpool to finally end the run on an emotional day at Villa Park. With money to spend in 2001/2002 hopes were high that a serious challenge for promotion to Division One could be achieved. However, despite record Season Ticket sales and subsequent record crowds at Adams Park (average of close to 7,000), the team failed to live up to expectations and slumped badly in the second of the half of the season to finish in 11th place. It was a clean sheet again for 2002/2003 but with several more faces on the playing side departed it was a testing season for those on and off the pitch. Form dipped towards the end of the season, Wanderers finished in 18th position and average crowds had dropped back down below 6,000. The 2003/2004 season was never going to be easy with several more crowd favourites and experienced players sent packing in an attempt to cut the wage bill. Ironically, Wanderers won for the first time in nine seasons on the opening day of the season while the Club parading as Wimbledon were dumped out of the League Cup in another encouraging display at Adams Park. The victory against Sanchez's former Club turned out to be his final victory in charge of Wycombe as a run of ten league games without a victory followed and it proved too much for the Wanderers Board to handle despite giving him the vote of confidence right up until the same month as his eventual departure.